I do so enjoy getting dressed up for special occasions and the Fort Wayne Philharmonic presentation of Holiday Pops was just that type of occasion. What could make it even more fun and special? 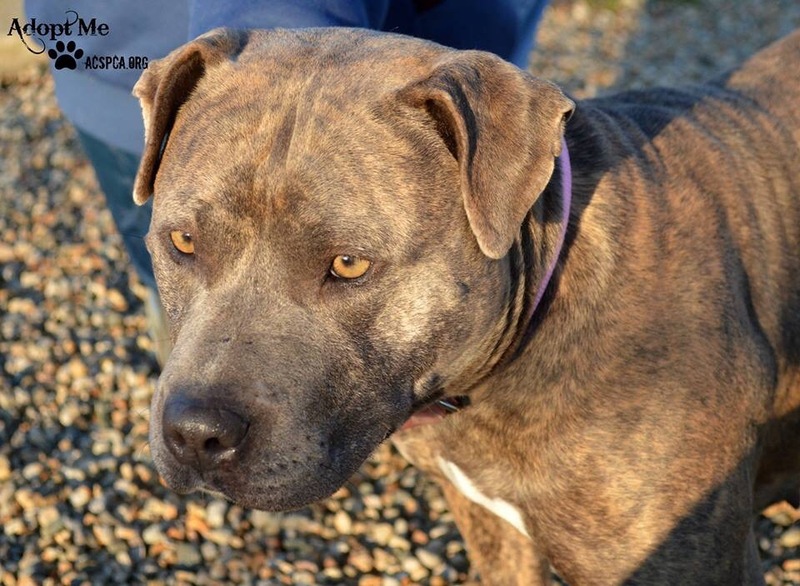 Being accompanied by and adoptable dog, of course! The Allen County SPCA joined forces with the Fort Wayne Phil to hae some adoptable dogs on hand for the performances and a few lucky pooches even got to go on stage! We volunteers were told in advance (at least I was) that we’d be handling small dogs since the singers taking the dogs on stage in all likelyhood weren’t experienced dog handlers, and I had my eye on a cute little poodly-do to be my date. Imageine my delighted surprise when, a few hours before the performance, I received a message stating I would be accompanying SnowDrop (ugh! that name!) For the evening performance, two of us would be handling larger dogs (SnowDrop and Myrrh) and the third would bring Candy and Cane, a bonded pair of Chihuahuas. After picking our pretty girl up at the shetler and securing her in the Pittie Van, I switched out her collar and leash for our Freedom Harness, a gold and pearl (duh, not real) necklace borrowed from my closet and a beautiful peacock colored tutu donated to me by our friends at Lamae Designs. 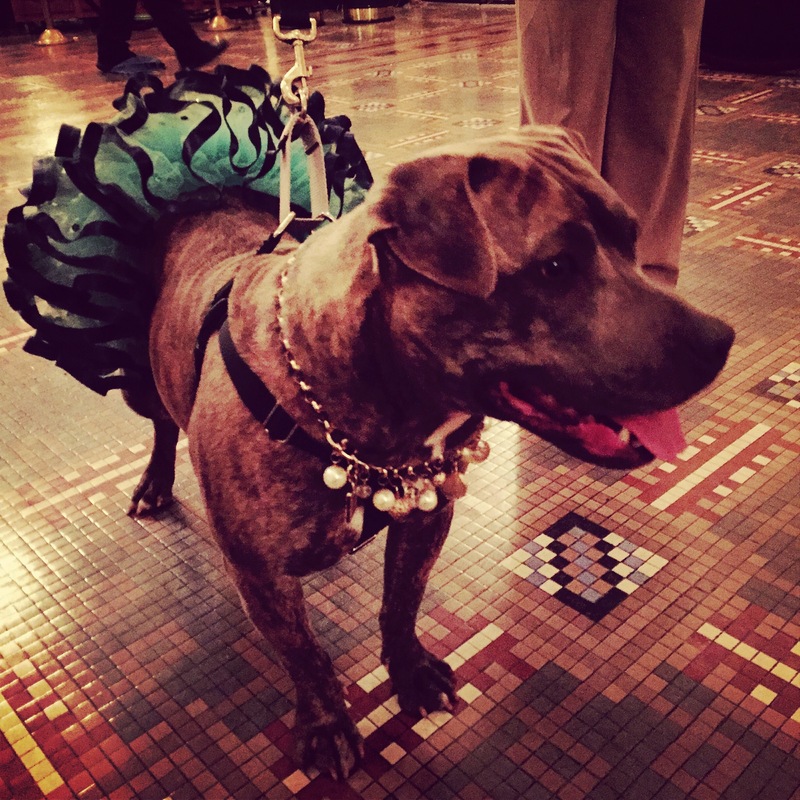 Not only did our girl rock her fancy attire, she was a perfect ambassador for -not just her “breed” -but for all adoptable dogs waiting at the shelter. She was well behaved, steady in the face of massive crowds around her, she was utterly affectionate to all who jockeyed in for a pat and some doggy smooches and she is apparently even house broken. People of all ages clamored around her to admire the fancy, muscular dog in a tutu and she was steadfast with the youngest to the oldest. As the Embassy seats filled up and people began vacating the lobby, SnowDrop settled on some pillows with a bully stick (of course!) for a well-earned break. She chomped happily uninterrupted on her treat until intermission and then once again donned her tutu and sparkled for the masses. I thought she might have garnered some serious interest and am hopeful that she made enough of an impression that those who fell in love with her will come back soon and fill out an application. This girl is a gem. After intermission, we packed up and all headed back to the shelter to get the dogs all settled in for the night and as I removed SnowDrop’s borrowed finery and settled her back on her blanket covered Kuranda bed, I couldn’t help but think of Cinderella at the stroke of midnight. 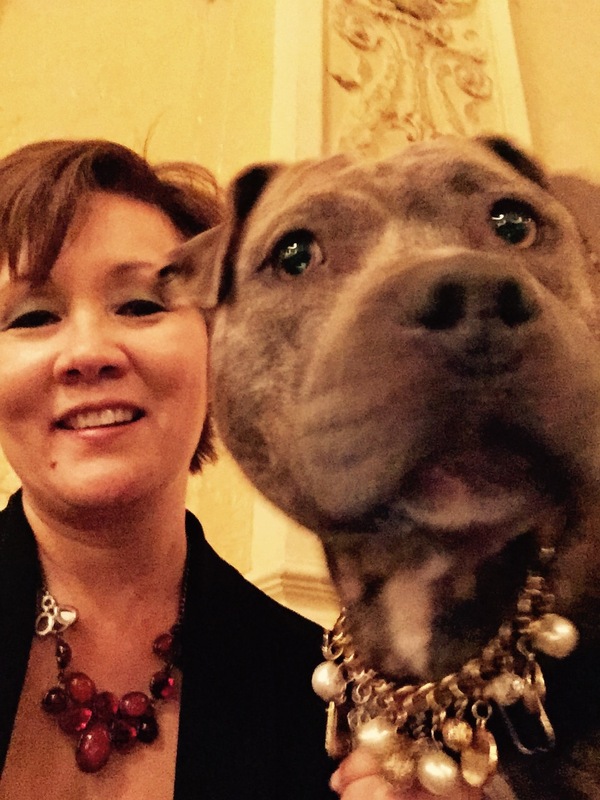 This entry was posted in adopt, adopt a pit bull, Adopt a shelter dog, Allen County SPCA, volunteerism and tagged adopt, Fort Wayne, holiday pops, philharmonic, staffie, tutus on dogs. Bookmark the permalink. AW – what a great pooch! Sounds like a fun night! Ahaha–SnowDrop is an odd name, indeed. She rocked that outfit, though! I hope she finds her family soon! She is stunning, I hope she gets her happily ever after!!!! Please keep us updated?! Two GORGEOUS ladies! GORG, i say! Love everything about this event! Too cool!